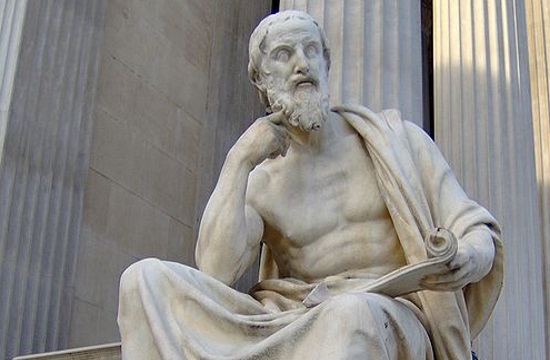 Archaeologists have recently discovered an ancient shipwreck which proves the Greek Historian Herodotus was totally correct about the observations he made almost 25 centuries ago. The shipwreck, discovered recently off the Mediterranean coast of Egypt near the ancient, and now sunken, city of Thonis-Heracleion was of a vessel called a ”baris, according to the following article by greekreporter.com. This exact type of ship was described in great detail by Herodotus in his book ”Histories” (ἹΣΤΟΡΙΑΙ in Greek) following a visit he made to the port city of Thonis-Heracleion in Egypt. Herodotus was impressed by the way people were constructing the ship, which was used to sail across the Nile River. For centuries, scholars and archaeologists believed that the type of ship Herodotus described never actually existed, because such ships had never once been found by anyone on the planet. This theory was recently blown up when a group of archaeologists discovered a well-preserved shipwreck off the coast of Egypt in the Canopic Mouth of the Nile, in the Mediterranean Sea. What the archaeologists saw witnessed when they dove into the waters was exactly the kind of vessel Herodotus had perfectly described in his book exactly 2,469 years ago. The 28-meter long vessel was one of the first ships used by the Egyptians to trade during ancient times. The vessels Herodotus described in his book must have been the exact same type of ship, but were only slightly smaller. Dr. Damian Robinson, the director of Oxford University’s center for maritime archaeology, points out that ”where planks are joined together to form the hull, they are usually joined by mortise and tenon joints which fasten one plank to the next. “Here we have a completely unique form of construction, which is not seen anywhere else.” Robinson remarked in an interview with Great Britain’s The Guardian newspaper. Most likely, this unique construction was the reason why Herodotus was so amazed when he saw this type of ship. The eminent historian was also astonished by the peculiar types of wood they were using to construct the ships, which to him was completely unknown. Archaeologists believe that what Herodotus saw could have even been constructed in the very same shipyard as the vessel they discovered, as a word-by-word analysis of Herodotus’ text exactly matches the appearance of the ship.